The usual answer is, “It depends.” And what it depends on usually involves any number of factors. And, usually, the person who asked the question hasn’t provided nearly enough information to allow anyone else to offer an informed response. The best we can do is offer a few suggestions on where the person can look to get answers to his (or her) question. Often, those suggestions involve Internet sources, but there is another source, and it’s one that has been around for more than two decades. And it is the subject of this review. 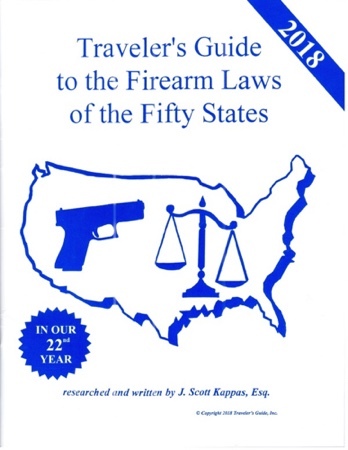 Traveler’s Guide to the Firearm Laws of the Fifty States is that source. It’s a printed, soft cover book that is issued annually. The publisher recently sent us a copy of the 2018 edition for review. We have purchased previous editions, so it has been interesting to see what has changed over the years. These explanatory sections are general in nature. They aren’t written in “legalese,” and they aren’t a substitute for an in-depth discussion of the topics suitable for examining specific legal cases and situations. They are intended to put everyone on the same page, and to provide a sufficient foundation in the basics to equip the reader to proceed to the discussions of the individual states. This introductory section has evolved over the years. The first edition of the Traveler’s Guide that I bought was the 1999 edition. In that edition, the “How to Use this Guide” section took up five pages, and wasn’t subdivided into specifically denoted sections. My next copy is the 2006 edition, in which the “How to Use this Guide” Section had expanded to eight pages, and was divided into specific, subtitled sections. In the 2017 edition it was up to ten pages, the same as in the 2018 edition. After the general, explanatory introduction pages, the Traveler’s Guide devotes one page to each state (including a page for the District of Columbia). The state’s name appears prominently at the top of the page as the heading. Directly beneath that is a horizontal scale, rating the state on its degree of firearms freedom. Zero equates to “Total prohibition,” and 100 equates to Total freedom. Beneath the bar is a caret symbol [ ^ ] to call out the author’s rating for the particular state. Above the bar is a number, preceded by either a ‘+’ or ‘-‘ symbol, followed by a brief comment. 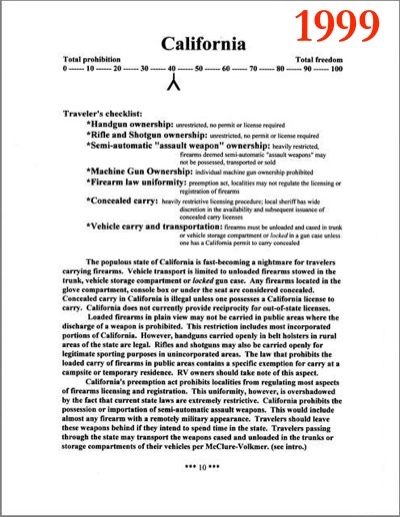 This is to indicate whether the firearms situation in that state has become better or worse, or remained the same, since the previous edition of the Guide. The remainder of each state’s page is devoted to providing a capsule summary of the laws affecting possession and carry in the respective states. There are no citations or references to the actual statutes; everything is expressed in plain, layman’s language rather than in legalese. 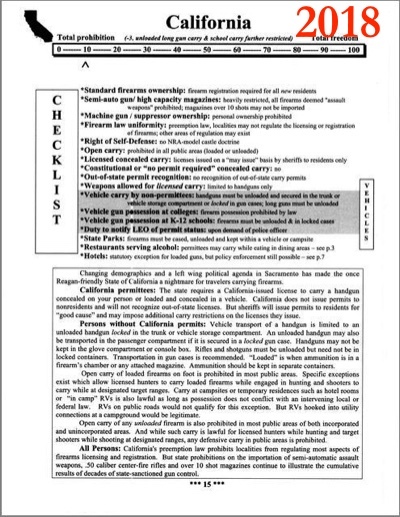 The crucial information is at the top, in a section highlighted by a box on the left called “Checklist.” The formatting of this section changed somewhere between 2006 and 2017; we think the new format is an improvement. Beneath the checklist is a block of explanatory narrative that touches on key points pertaining to each state. This section, too, has been reformatted at some time between the 2006 edition and the 2017 edition. In the early years, this was just a block of text, all in bold-face type, with no headings to break up the text or to signify a change in topic. The new format has the body text in standard type, with a bold-face lead-in for each paragraph to inform the reader what that paragraph covers. The new format is a distinct improvement over the older layout. Following the last state (Wyoming), the author includes a page discussing travel to Canada and Mexico. Most of this page is devoted to Canada. The discussion of travel to Mexico takes up the last (short) paragraph, which we can summarize here very simply: DON’T DO IT. To close out the book, there are two pages devoted to listing the agency to contact in each state for further information. Following that is a three-page section that spells out reciprocity provisions for those states that offer reciprocity or recognition. Not all states recognize permits or licenses from other states. 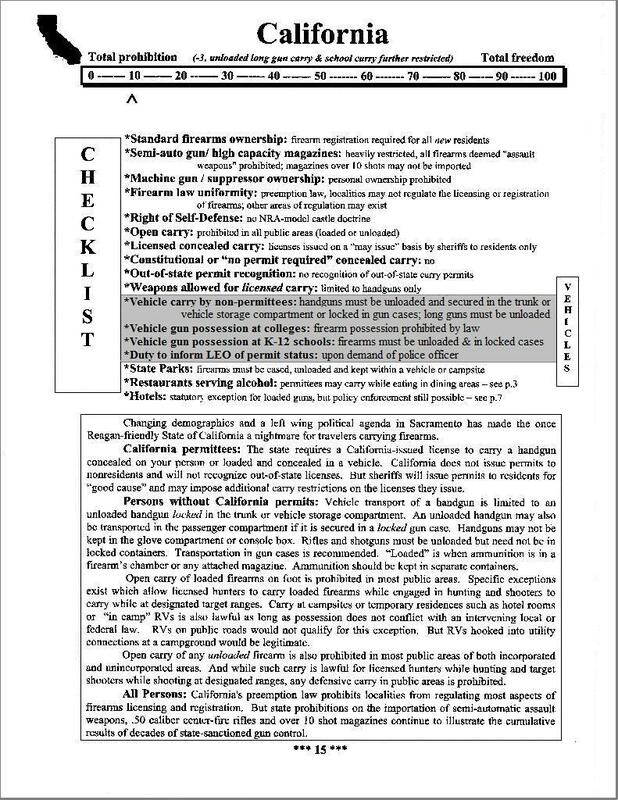 If a state isn’t listed in these pages, that simply means that state does not offer reciprocity and does not recognize permits or licenses from any other state. The 2018 edition contains 67 pages. The 1999 edition was only 60 pages. 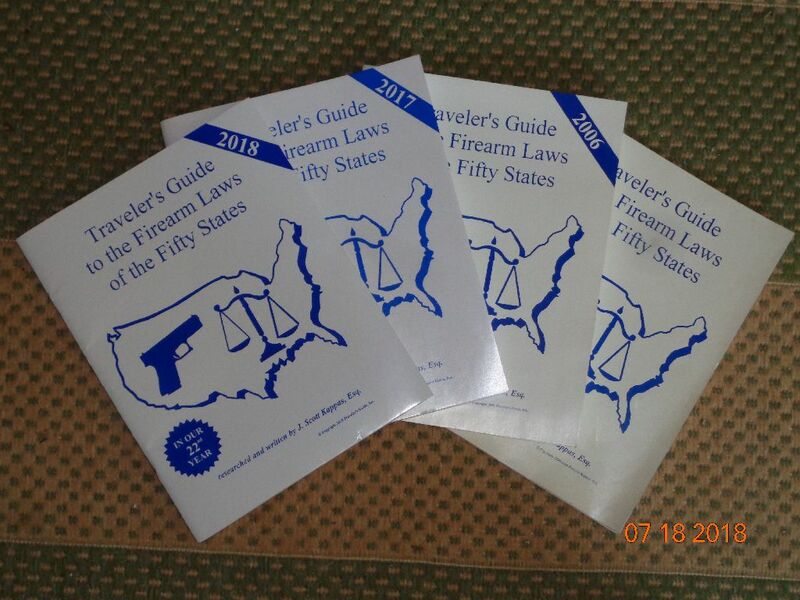 The Traveler’s Guide to the Firearm Laws of the Fifty States is a good starting point for researching the legal climate for firearms in states you might be considering visiting, or that you may need to pass through to reach a final destination. The nature of the Guide is such that it cannot be an exhaustive, in-depth exposition of the nuances of each states firearms and self defense laws. It’s an overview and, for what it is, it’s a good one. The publisher sent me the 2018 edition for review, but if I didn’t think the book had value I wouldn’t have bought the 2006 and 2017 editions with my own money after seeing the 1999 edition. What could be improved? 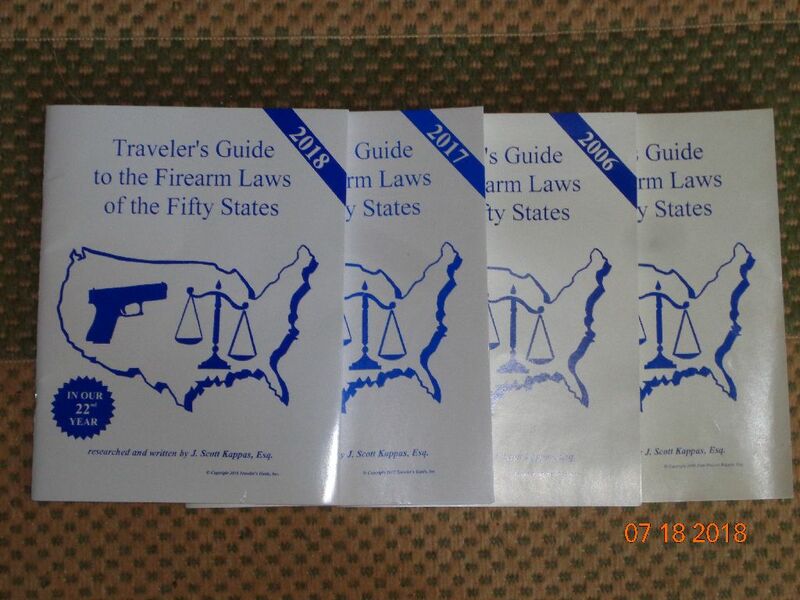 The Traveler’s Guide is what it is, a guide to the firearms laws in the states. That said, the book is intended as a guide for travelers. Most people who are serious about guns and self defense know that some states are “injun territory,” where sane, honest people simply don’t carry or even transport firearms because of the draconian laws. Cautious travelers who must go to or through those states naturally wonder what they can have for self defense if the laws don’t allow them to carry a firearm. 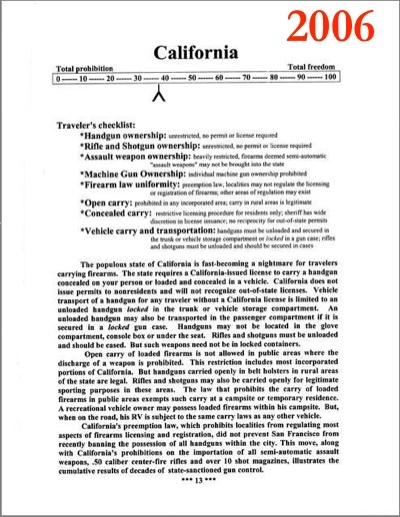 For this reason, ever since I bought the 1999 edition I have wished that the Traveler’s Guide would include at least a brief mention of whether or not travelers can carry knives or pepper spray (or electronic stun guns) in states where guns are prohibited. Sadly, discussion of alternative tools of self defense has not yet made its way into the Guide—and, given the one page per state format, it may not be possible. If the format were expanded to two pages per state, obviously more information could be provided and the discussion could then touch on alternative weapons. But, then the book would be twice as many pages, and the price would have to reflect that. The book is available from various websites and vendors. Our review copy was provided to us by ConcealedCarry.com, which is an authorized reseller of the book. The price is $19.00. You may discuss this review, in our Forums site in this thread.